Georgia Pesticide Applicators Have New Training Options! In 1999, the state of Michigan amended the law (PA 230 of 1972) to require all jurisdictions in the state to use the currently adopted version of the state construction code. The current version of the Michigan Residential Code is the 2015 version, which took effect on February 8th, 2016. In 2008, the state of Michigan amended the builders licensing laws (PA 299 of 1980) to require ALL individuals who possess a Michigan Residential Builders License to have a current copy of the Michigan Residential Code book in order to their renew their license. How Often is the Code Book Updated? The Michigan Bureau of Construction Code (BCC) is required to update the Michigan Residential Code at least every 6 years. In the past, the BCC updated the code every 3 years, but this time around they chose to update the code on a 6-year cycle. The Michigan residential construction industry will not know when the next Residential Code will be adopted until the BCC announces that a new version of the code will be published. The soonest a new version is published will be in 2019 and the latest could be 2022. The state of Michigan requires by law that individuals wanting to renew their residential builders license own a current code book. For the 2017 license renewal cycle, the 2015 Michigan Residential Code is required. It is known that the 2015 Michigan Residential Code has some errors in the book. The Michigan Bureau of Constriction Codes (BCC) has acknowledged the errors and has published some corrections on it’s website. The BCC has stated it will continue to post corrections on its website when they become aware of the errors. The BCC has also stated it will not publish a revised version of the 2015 Michigan Residential Code book. 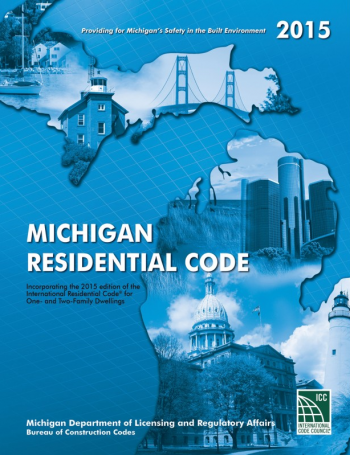 The 2015 Michigan Residential Code book is the only version currently available for the 2017 license renewal cycle. The International Code Council (ICC) is the Copyright holder and the publisher of the International Residential Code (IRC) which the 2015 Michigan Residential Code adopts. The ICC will only allow the Michigan Bureau of Constriction Codes to revise the 2015 Michigan Residential Code because of the Copyrighted material that is adopted. No bookstore can revise ICC copyrighted materials and publish their own version of the books. The Builders License Training Institute, a division of Certified Training Institute, is a proprietary school and bookstore offering online and classroom Michigan Builders 60-Hour Prelicensure Programs, continuing competency courses, lead paint safety RRP classes and Michigan Code Official continuing education. This entry was posted in Construction, Plumbing and tagged Code, Continuing Education, Michigan.